Create a sophisticated presentation at your next catered event or special meal with this Fineline Silver Splendor 510-WH 10" white plastic plate. Made of heavy weight plastic, this strong and sturdy plate is perfect for wedding receptions and luncheons. Great for serving main entrees, this 10" plate adds style and class to any tabletop. Embellished with two silver bands, this plate boasts a distinct style that combines the convenience of plastic with the elegant appeal of china. Absolutely love these plates. We use them for our nicer holiday parties and it has made our table settings look very sophisticated. I have searched everywhere to find these in a large quantity at a good price and Webstaurant beats everywhere else hands down! Highly recommend these. You won't regret trying them even for smaller parties. These are great for weddings and graduations. They are very durable and beautiful. They look like real china and no one would know the difference unless the plate was touched. I would recommend this. These worked so nicely for my wedding a couple years ago. They look like real plates, are nice and sturdy, and are recyclable, which I love! We used these for our main entree. This is a nice sized dinner plate. It is bendable, but I don't think it would break if it had heavy food on it. There is 6.5-7" in the middle before the edge raises. These plates are the perfect choice for a formal dinner, without the high cost. Along with elegance and quality, you won’t be disappointed in this product! These plates were perfect for a formal dinner. They had a good weight to them and really didn't look like inexpensive plastic plates. My Grandmother reused one for about 8 months and it held up just fine. These are perfect when you want some extra elegance! We use this plates for a New Year Party and the looks is so beautifully, it make looks that is so real. They are very durable. These plates are study and elegant. They are the perfect size for a full entree. You will not be disappointed by placing your order for this item. Love these plates we just used them for a catered wedding of 300 people. The cost is better than regular china and they look far better then your standard disposable tableware. This was important because the bride was on a budget but didn't want cheap paper plates for her wedding. They held us very well to the amount of food being put on the plates they are sturdy and look great. The bride and all the guest had only good things to say about the plates. This is my go to plate for catering now. Thank You. Great buy! I have been searching all over for quality plates at a good price and these are it! They are sturdy and I love the simple yet elegant design. With there was a better word to describe this besides love!! It exceeded my expectations on quality, and looks. The disposable aspect was great too! These are exactly what I was looking for and just as shown in the site photos! They're beautiful and will go great with the rest of our wedding decor. They look durable and are very light weight and look so close to the real deal, so much more cost effective than renting. We use these for inside dining at our coffee shop. The price is fantasy for the quantity and our customers have always seemed to like them. These plates will work for our outdoor Botanical Garden wedding. We ordered over 100 of these and a couple of them came with the silver part scratched but other than that they are fine. They seem durable and strong enough to work for what we need them for. They will go nicely with our eggplant purple napkins and Silver chargers. Will repost pics after the wedding. We appreciate your review, Kimberly! If you ever have any questions about the product you have purchased, please reach out to our Customer Solutions team. This is one of the nicer looking plastic plates that we use for banquet service when the customer wants everything to be disposable. It is way better than any paper or foam plates that would typically be used for an event and the silver band adds a bit more elegance to the event even for it being disposable. Great product! I recently purchased these for a wedding reception I catered. The client did not want glass plates but wanted plates that seemed real; I showed them these and they were perfect for what they wanted! You could even wash them and reuse them if desired. These plates are lovely and elegant. They are strong. The trim was silver not gray. The plates arrived on time and were everything I expected them to be. These plates are beautiful as well as durable. When you can't use china, they are definitely the way to go. I do recommend and I will buy these again! Ordered to see if i would like to use them for my wedding. They are nice plates but are on the flimsy side, i will no suggest using for a wedding. Very sturdy, durable and attractive. I was slightly concerned that these plates would look "cheap", however I was pleasantly surprised and proved very wrong when they arrived. I would use these for any occasion, as we used them at our recent wedding reception. A round of applause! These plates are so beautiful and also firm. i had so many of my guests asking where i got them from. Bought The Fineline Silver Splendor White 10" Plastic Plates with Silver Bands for my daughter’s Christening coming up in May, I still can’t believe how beautiful and elegant they look in person, and the best part of it was that they weren’t too expensive compared to other websites. I know everyone will be asking me where I got them from and I will be happy to tell them. Fast shipping too, placed my order Sunday night and was delivered Tuesday afternoon. Super sturdy plate and it looks like the real thing, if you don't mind the cost. Guests were heard commenting that these could be washed and reused! 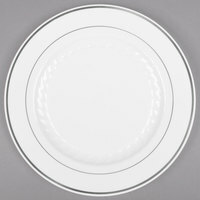 The Fineline Silver Splendor White 10" Plastic Plates with Silver Bands are a great purchase! They're very sturdy and firm, as well as stylish and a great upgrade from a basic paper plate. The plates hold more than enough food for one sitting, but would withstand second and third helpings of a delicious meal. Very nice quality plate that presents nicely and works well as a cost saving plate in lieu of china. We use at plenty of weddings and nice events. Very generously sized realistic looking disposable plates. Will be using these at my place settings at my reception. They should certainly be large enough for the entrees and sides we are serving. Five stars. A great disposable plate that is requested for weddings and high end events. it looks elegant and is very durable to hold multiple food items without bending. Bought these plates for a big wedding we catered. Elegant and classy appearance, very sturdy, great quality. Would highly recommend this product for any event that requires a bit more visual appeal to the dinnerware. A bit more pricey than other options but the look of the plates especially with food on it is well worth the extra cost. The ultimate in fashionable dinnerware! Provides a beautiful table setting with easy clean up for a very affordable price. There were many compliments on the table settings for our daughter's wedding! Love these plate. They look so real and are perfect for any formal event... I will order these every time i have something. They makes the event look more elegant. These plates were fabulous. They were exactly the elegant look I was going for. The wedding I planned went great with these. Plates and they were sturdy which was my main concern because I seved heavy soul food. These plates are beautiful! I also set the table with the 7" salad/dessert plate and the matching 12 oz bowls. The church loved it! These are a repeat! I decided to use these for the holiday family dinner last year so no one would have to spend time in the kitchen doing dishes. They look nice, and everyone agreed it was a great idea. I bought a package at "the big box store" but since I've discovered webstaurantstore I'll be getting all my future supplies here. Fineline silver 10" plastic plate are high quality for the price. My guest kept asking if I was sure I wanted to dispose of them. Shipping was fast and customer service was excellent I highly recommended them. Have used several different kinds of plastic ware from Webstaurant. The bride wanted the china look without having to rent real china so we went with this plate. It is a little on the lite side, but until you pick it up, you would think it was real china. Works great on a buffet line! Ordered 2 cases of these plates for my son's upcoming wedding. Ordered on Thursday night; they arrived on Saturday! They're beautiful and very sturdy - much higher quality than expected. Fineline Silver Splendor 510WH White 10" Plastic Plate with Silver Bands - 120 / Case A nvery nice plate for the money.. can't go wrong. Was looking for plates for my daughters wedding. Wanted more classy plastic plates. These have the look of fine china! Compared to other websites, prices can't be beat! Very satisfied!!! The plates were elegant with nicely silver lining like a glass plates and Were in perfect party size . I got it for an event and got lots of compliments . I loved the plates:) They were nice and elegant. They were nice. We like the wat look great on the linens and made the baby shower look elegant which was what we were going for. I would order again. These are my standard for high end affairs (unless client insists on china). The silver is shiny, not dull. Holds lots of food and looks like real silver rimmed china. Very nice. Don't forget salad and dessert plates to match. Outstanding! Nice plates. Seem a bit larger in person. Medium weight upscale disposable. Perfect for a buffet luncheon or dinner. Silver band scrapes off very easily. Must be careful and cannot re-use. Overall a good value. Good Value - priced other websites and found the best price here at Webstaurant. Friendly, courteous and responsive customer service. Flexible billing and shipping options.